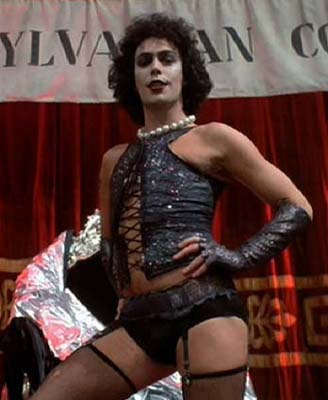 First time I saw The Rocky Horror Picture Show was at a small multi-plex at the local mall. This was in the days before stadium seating and IMAX, and the theaters were tiny, with Rocky relegated to a practical shoebox. The regulars who showed every late Saturday were mainly young adults in flux – some went to community college, others just worked to make a living. There were potheads, people of varying sexual orientation, and the occasional group of virgins who more than likely left after the “Sword of Damocles” number when the makeshift “cast” ran out of gas and settled into seats to tiredly tossed retorts at the screen. Those were the days. Now, over 35 years later, Rocky seems in vogue despite having graduated from occasional guilty pleasure to victim of overkill. The beauty of this quirky film, I’ve always believed, rested in the fact that the midnight movie arena was the only place you could see it. As movies moved to VHS and DVD, RHPS was a holdout – my earliest memory is copying a copy of a Japanese import, and what fun it was to see Kanji subtitles flash in time to the tunes. Now, venues hold anniversary showings, and GLEE did an episode devoted to the cult classic. With Halloween nigh, Frank and Brad and Janet, etc. are enjoying a brief spike in popularity to rival the Jersey Shore folks. Are you going to see the flick this Halloween? Cool! Sneak a toke beforehand and enjoy the buzz, or pack a space cake for the time warp. If you’ve elected to watch it at home, though, know it won’t have the full effect it does on the big screen, especially if you plan to have over friends who’ll get in the way of your TV. You can always opt, too, for lesser known midnight classics which have aged well and play wildly and wonderful on a nice kush buzz. Yeah, yeah. Compared to the majesty of Pixar and imitators, the animation of Heavy Metal seems grossly outdated. Yet, what is notable about this film is how ahead of its time it was – combining adult themes and a killer rock soundtrack with a cartoon for a commercial release was practically unheard of when this movie came out, and for older tokers and young folk with an appreciation for the classics, this anthology of sci-fi stories is worth a viewing with the lights out. The Dude still abides, no matter the time of year. If you’re in the mood for a lethal combination of intrigue and bowling, get this in your video queue and prepare for a true religious experience. Still regarded as one of the more popular concert films ever made, Song is a slice of music history that marries the classic music of Led Zeppelin with intimate snatches of the band’s lives. Die-hard fans will and have enjoyed it, and if you’re looking to rock out this Halloween check out the reissued DVD or Blu-Ray with new footage. Whatever your viewing pleasure for Halloween, be safe and watch the sweets. 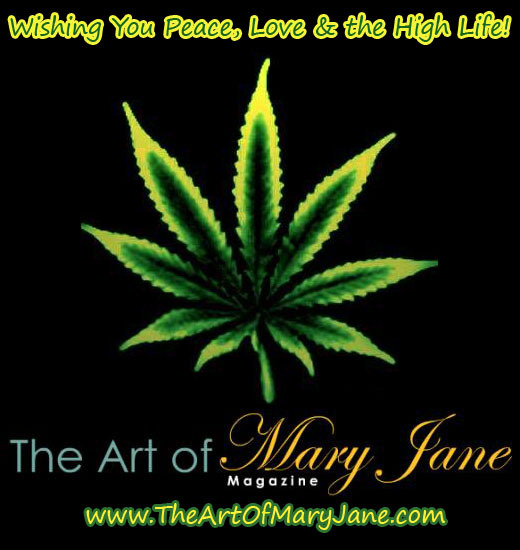 Note: this is an abridged version of an article that appeared in The Art of Mary Jane, the magazine. Whatever your level of marijuana consumption, finding the optimal partner with whom to share you love (and your stash) can be a tricky proposition. On the one hand, busting out a joint five minutes into your first date might turn off the object of your desire, even if he or she has no real aversion to the sticky icky. On the other hand, keeping your pot smoking habits to yourself for more than a couple of dates could lead to your potential mate regarding you as untrustworthy or disingenuous. So where’s the happy medium? First off, let’s consider where you have met this potential partner. Is he or she a friend of a friend, and is that friend a stoner? If so, you can do a little “research” with your buddy, who shouldn’t have any qualms about letting you know if your current love interest like to puff, puff, pass. If you met him or her at a party where weed was whipping around the room, odds are there isn’t going to be much judgment about your own smoking, regardless of his or her habits. If you met at church, play it careful. If you met at a Buddhist meditation sangha, you play that opportunity fast and loose. There are plenty of pot smokers who frequent other sites, and who may well have a broader range of interests. Once you’ve found that potential mate and are determined that he or she is down to get high, there is that all important ritual: the shared smoking of the first bowl. This experience will reveal all sorts of things about your partner, based upon both smoking habits, and habits of mind while in an altered state. Have you met a fellow toking soulmate? Did you go online, or meet at a dispensary? We want to hear your stories.